As any new parent with wanderlust knows, making travel plans when you have a toddler can be a challenge. Cruising with a child on a brand like Azamara raises many questions and concerns. But eventually, I do want to take my son with my on an Azamara voyage. To help make our first Azamara experience with our 16-month-old son easier, and to help educate other parents in the process, I’ve gathered some key information on planning a voyage with kids of all ages. What do Azamara ships have for children? My first questions as I began my research were, “Do the dining rooms have high chairs?” and, “Are cribs available onboard?” The answer is yes. Our ships have play yards that double as cribs, just like any hotel. High chairs are available in the Discoveries Restaurant, Windows Café, Aqualina, and Prime C. Parents or grandparents don’t even have to request one when they book. Our ships receive the passenger manifest about a month in advance, which shows how many children are on that voyage, and whether they will need cribs, high chairs, and booster seats. Milk is also available onboard, but you should only request it when you plan to serve it right away. The minibar refrigerators are not intended to store milk. There are also a variety of juices available, but not juice boxes. What don’t Azamara ships have for children? My next questions were all based on what I’ve run into on my travels with my son so far. Are there diapers onboard? What about baby food, in case I run out? (My kid loves to eat!) 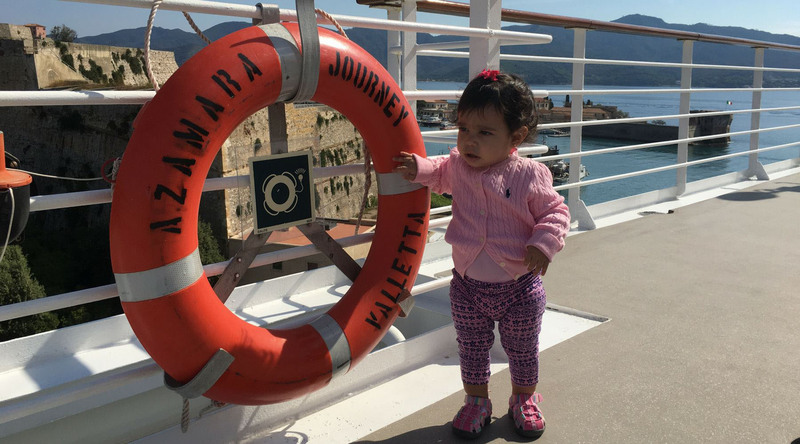 Azamara does not stock diapers, baby food, infant formula, sippy cups – pretty much any baby supplies you would expect to find on larger cruise lines that cater to families. If you’re traveling with a baby that is just starting to eat solids, prepare to pack enough packaged baby food to last you through the length of your vacation. For families of toddlers who are self-feeding, you may not want to pack as much food. There is no children’s menu, but we do have kid-friendly staples such as hot dogs, hamburgers, chicken fingers, French fries and pizza available. How should parents prepare for a voyage with children? Azamara does not have organized activities for children, so you should prepare to bring plenty of entertainment along. Load up a tablet with movies and TV shows. Pack a backpack with their favorite toys, coloring books, and crayons. It’s also a great time to learn about the destinations and languages you’ll encounter together. Board books are a fun, colorful way to begin introducing children to new cultures. One of my favorites is Hello World! which teaches you how to say “hello” in 10 different languages. For kids who are just learning to read or who are already reading, the daily Pursuits flyer and Port Explorers are packed with interesting information about each destination which can be read together. Children in diapers and children who are not fully potty-trained are not allowed in the pools, so leave the swim diapers at home. Babysitting services are not offered onboard, so plan accordingly. Can children join Azamara Shore Excursions tours? As you plan your shore excursions, keep in mind that pricing, age limits, and restrictions for infants and children vary for each tour. A dolphin encounter excursion would have a younger age restriction than, say, a zip-line excursion, but infants wouldn’t be allowed on either. Restrictions are based on the safety standards our tour operators must follow. Ask the Cruise Global, Connect Local shore excursions staff onboard for help clarifying which tours are appropriate for your family. Whether you’re planning your Azamara voyage with your children or grandchildren, I hope you found the answers you were looking for. Bon voyage! Paulina Aguilera has been a shoreside member of the Azamara Club Cruises marketing team, based in Miami, for over two years – and is the proud mama of Lucas. Follow her on Twitter @sweetatarian.